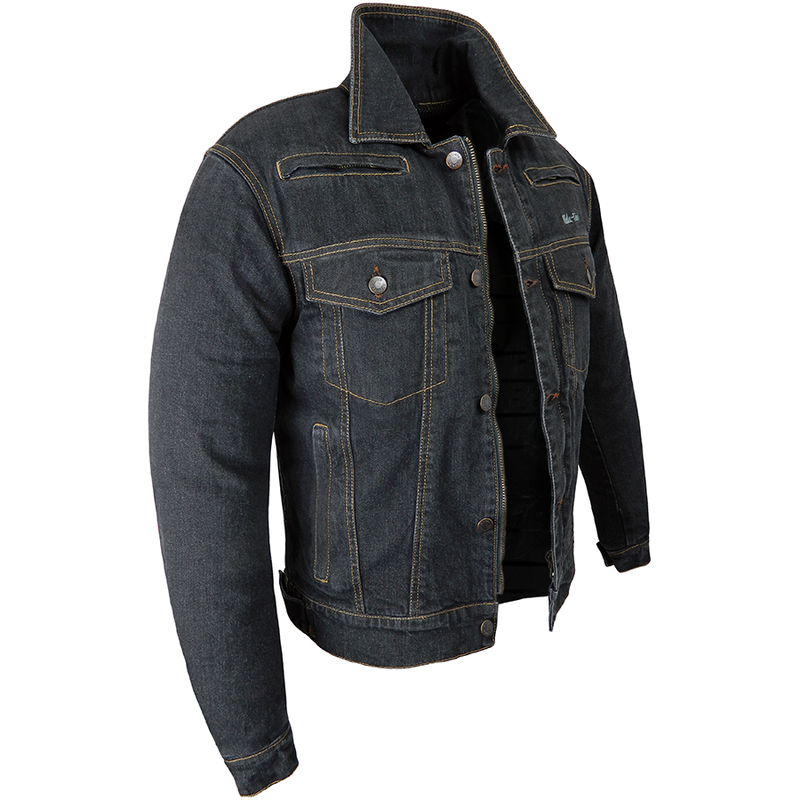 It may have the look and style of a normal denim jacket but don't be deceived by first glance. This high-tec garment is guaranteed to impress both you and your fellow bikers. 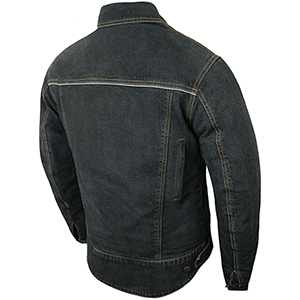 - Constructed in heavy duty 14oz denim (heavier than normal denim but still comfortable to wear). - Heavy duty YKK front zip fastening with buttoned flap to keep the traditional denim jacket look. 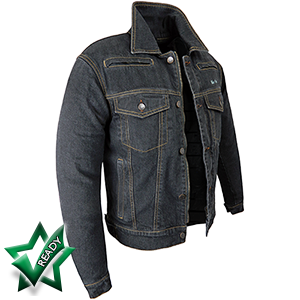 - Fully lined with super strong genuine Dupont™ Kevlar® and black airtex cotton. Cotton is an important lining for motorcycle garments as it doesn't melt into your skin in a slide down the road (from friction heat) like a man-made lining can (e.g. Polyester, Nylon etc). - Two external zipped pockets and buttoned chest pockets. - One internal zipped pocket. - Longer back for cover and comfort. - Two back and two chest air vents for super comfortable hot weather riding. 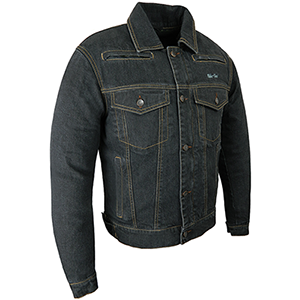 - Thick, heavy duty thread and internal stitching holding it all together. - Reflective piping across back for visibility. Smooth Ways CE Back Protector available to fit in the back pocket incorporated in this jacket. This back protector is tested and approved to EN1621-2:2014 category II standards (superior to category I products). Tested and approved at low, moderate and high temperatures. Designed to fit the contours of your body and absorb impact, this back protector is unobtrusive in looks and offers optimum comfort for the rider. When purchased with CE shoulder and elbow armour, the back protector is the bargain price of £9.50! Not forgetting the most important feature of all; our unique, exclusive and fully adjustable Viscotec CE memory armour system (armour optional). Shoulder and elbow Viscotec CE armour can be placed in exactly the correct position for you give the jacket the best possible chance of protecting you when you need it most. The armour itself molds to your shape and has feathered edging making it comfortable to wear and discreet in appearance. Being memory armour, in the event of a crash it will absorb the brunt of the impact, transferring the least amount of trauma to your bones as possible. This jacket really is a superb option for riding SAFE AND IN STYLE when not choosing leather. Aramid - DuPont™-KEVLAR® are trade marks of E.I DuPont De Nemours and Company, USA.